One of the reason we wanted to visit Toulouse (in addition to allowing me to practice French) was to take a tour of the Airbus Industrie Factory. It wasn’t a reason for us to go to Toulouse alone, but it was something I was getting excited about. Seeing the A380s being assembled and walking around and sitting in classic Airbus planes including Concorde would be a fun way to spend a portion of the day. 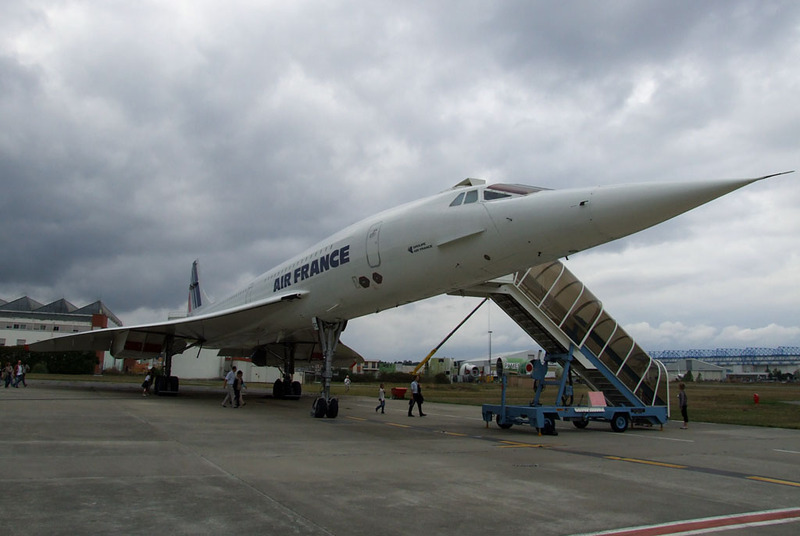 I’ve been on Concorde before, at the Intrepid: Sea, Air and Space Museum. I do wish I could have flown this plane before it was mothballed. Such is life though. Anyway, we were going to spend some time on the factory tour, but I went to buy tickets and they are completely sold out (or otherwise unavailable) when we are there. Our visit is in August and it is France — it wouldn’t surprise me if the factory/tour is just closed for the month. I can’t figure out if it is closed or sold out. This is a bit frustrating. I didn’t put much thought into this tour until now — when I know I can’t go, now I’m disappointed. I’ve heard from friends that the tour is just OK, nothing special, but now that I can’t do it, I really want to. Grrr. Have any of you been on the Airbus Industrie tour? Was it worth the visit? What else did you do in Toulouse? Do you have irrational travel anger/frustration, like me? If you’ve enjoyed this post and want to be the first to know when I’ve published a new one, sign up to receive them via email or directly in your RSS Reader. Follow me on Twitter or Google Plus too! Earlier this year we planned a lovely trip to Vietnam, you can read about it here, here, here, here, here, here and here. Unfortunately we had to postpone it because of my accident, read about that here. Now we have two weeks of vacation that we intended to use in March — how can we use these weeks? By planning a quick trip to Europe of course. MS loves Barcelona – it is his favorite City on the planet. I don’t really care for Barcelona myself; I’m sure if anyone can change my opinion he can. One of my favorite cities on the planet is London and since they are hosting the Olympics this year how could I not stop by to say ‘hello’? After London and Barcelona, I wanted to pop across the border into France. I’ve been studying French at Alliance Francaise and I want to practice my language skills. Since I’m also a big airplane nerd, I want to visit Toulouse and stop by Airbus Industries for a factory tour (total nerd, I know). We are still working out the details of the itinerary for London, Barcelona and Toulouse. I’ve spent a ton of time in London, have dear friends and limited time in the City. I’m really looking for suggestions for things to do and places to eat in Barcelona and Toulouse. Are you going to the Olympics this year? Have you taken a trip to the Airbus factory before? Is it worth visiting? Are you planning a trip to a City you have historically loathed but going to see it in a new light? My trip to Trinidad was my first trip traveling abroad in many years – It was good to truly travel again and it was great to see EAD again. One thing I noticed while in Trinidad was the number of people just hanging out. Sitting on the side of the road outside their car listening to music (Soca music specifically). Evidently this practice is called liming. I initially thought that Trinidad had a high unemployment rate and these folks had nothing else to do — but that’s wasn’t right. The unemployment rate was (and still is) about 5-6%. This is just a great cultural difference. Enjoy life – you see a friend on the street, pull over and hang out for a bit. I think we need to embrace this mentality a bit more here in the US. My trip to Trinidad was quite quick – I had a really nice time visiting, but I always have a great time when I’m visiting EAD (and JFB). It matters more on who you are with than where you are. Would I go back to Trinidad? Probably not, but not because I didn’t have any fun, but because I have so many places that I’d rather visit. Have you been to Trinidad? Did you love it? Do you love drinking Caribs and Limin’? Do you know bring a bucket of chicken as your carry-on bag on the plane? Every once in a while I have an urge to make something that may just stop my heart. This urge hit me two weeks ago. I want Cheesy Potatoes Au Gratin. I needed to buy a mandolin. Before I go any further, you should read the story of why I don’t have a mandolin. Ever since my accident in February I haven’t been able to use a knife all that well (getting better every day though). The only way I could make this dish was if I bought a mandolin. After nearly 16 years without one, I caved in and went for it. I scoured the Internet for just the right recipe. I wanted cheese and I wanted more cheese. What I found was quite delectable. Yes, these really are the only ingredients. 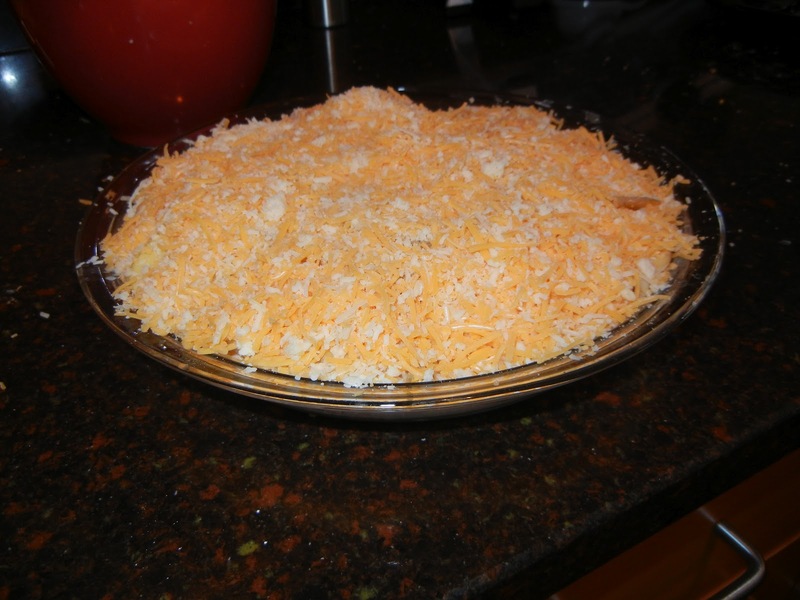 You put the potatoes in a 9″ pie plate – my recipe called for a 9″ deep pie plate — which is one deep plate! Obviously a misplaced/lost piece of punctuation there. Overlap the potatoes a little and fill the plate. Pour in the heavy cream so it is just touching the bottom of the top layer of potatoes. Salt and pepper to taste. Cover with the cheese. Put the pie plate in your pre-heated oven (425F) and bake for 50 minutes or until cheese is golden brown and potatoes are fork tender. None of the recipes I found suggested you line your stove bottom with foil, or use a baking sheet below the pie plate — but you should. 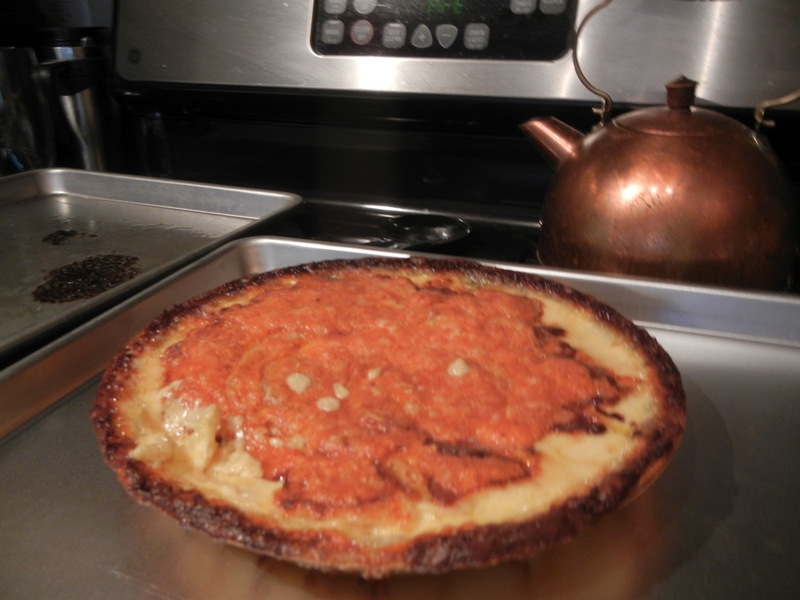 This cheesy gooey mess really did a number on my oven. This makes 4-8 servings depending on how really crazy you are. Two of us ate about 4/5 of the plate of potatoes — saving me a little leftovers for the next day. This recipe was so easy – and it allowed me to get back into the mandolin habit. It is probably one of the least healthy items I cook, but good god it was tasty! After a few days in Trinidad on vacation it was time to go home. This time I flew from POS-MIA-ORD (MIA in lieu of SJU). The flight was in the afternoon, so we had plenty of time for a quick lunch before we headed to the Airport. We had doubles, which were delicious. I have no idea where we ate, it was just a little inconspicuous restaurant on a sleepy side street. Only locals were eating at this place, the exact place we should be eating at every time we travel. I got to the airport about 2 hours before departure – as I didn’t know how backed up ticketing and security would be. It was light – no one was there and I managed to get my boarding passes and make it through security within 20 minutes – which is amazing fast compared to the arrival process. I had enough time to swing by duty free and pick up some great Trinidad rum – Angostura 1824 Rum. I did make sure to double check with the US Customs folks to make sure I wasn’t buying too much (or not enough). I head over to the gate to find that boarding was well underway – I arrived at the gate 40 minutes before departure and we were already boarding my area (and since I had no status I was at the very end of boarding spectrum). I boarded American’s 767 and sat in an aisle seat on the far right side. I approached my seat and found all the overhead bins full and to my surprise the under seat storage in front of my seat was taken. I asked my seatmate if she had stowed her items in my storage area as well as hers — she had. I asked her to move them, she said no. How perplexing. What is that smell? Ah, yes, a bucket of Kentucky Fried Chicken between her feet. Lovely. I ended up calling the Stew to assist me in negotiating with this stubborn woman from Trinidad. After she told him she wouldn’t move her items he grabbed the items from under my seat and asked her which items were hers in the overhead bin. Once she pointed them out, he yanked them from the bin and handed them off to a colleague. He then grabbed my duty free bag and put it in the now vacated overhead bin. He then proceeded to grab her bucket of chicken and cram it in the overhead bin. I wish every stew was as efficient and logical as this guy. Kudos to American for this guy. This is going to be a lovely flight, eh? After take off she got up and pulled down her bucket of chicken. She was nice enough to offer me a piece of chicken too. I passed. The only other interaction I had with this woman was when she asked me if I had a spork for her side of mashed potatoes. Alas, I did not. She was quite resourceful — she stripped the meat, skin and tendons from a drumstick, leaving just the bone. She then proceeded to use it to dip out the potatoes. She’s the Trinidad Macgyver. We landed a bit late in Miami and as I was running through customs and immigration I ran into an unscrupulous agent. He informed me that I was only allowed to bring in two liters of booze — he proceeded to throw 3 of my bottles NEXT to the trash. I know he was stealing them, but I was running to catch the last flight to Chicago. I didn’t have the energy to fight with this crook. What a water cooler dictator. My next flight was outrageously uneventful. I made the flight right before the door closed. The 3 hour flight to Chicago was over almost instantaneously – I slept the entire time. No snack, no movie, no cocktail. I was home before I knew it. Have you ever brought a bucket of chicken on a plane? Have you ever eaten a piece of KFC offered by a stranger on a plane or elsewhere? Do you find yourself Macgyvering a bone into a spork? Why do the crazies sit next to me?